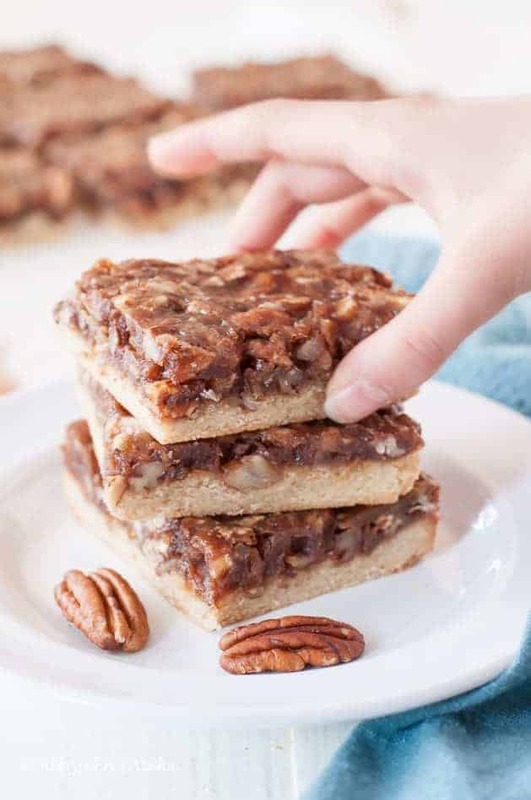 Decadent maple syrup and sweet dates combine to make a smooth and creamy filling for these Vegan Paleo Pecan Pie Bars. Add some nutty chopped pecans, and a delicious shortbread crust – it’s a match made in heaven! Can you believe it’s the week of Thanksgiving?! I’m sitting here wondering where in the world the time has gone. Next thing we know it’s going to be Christmas! Ever since I created my Guilt-Free Pecan Pie Cookies, and received such awesome feedback from my readers on them (You all are amazing! I’m so happy all of you loved them! ), I’ve been wanting to modify the recipe to turn it into bars. So that’s what I finally did. 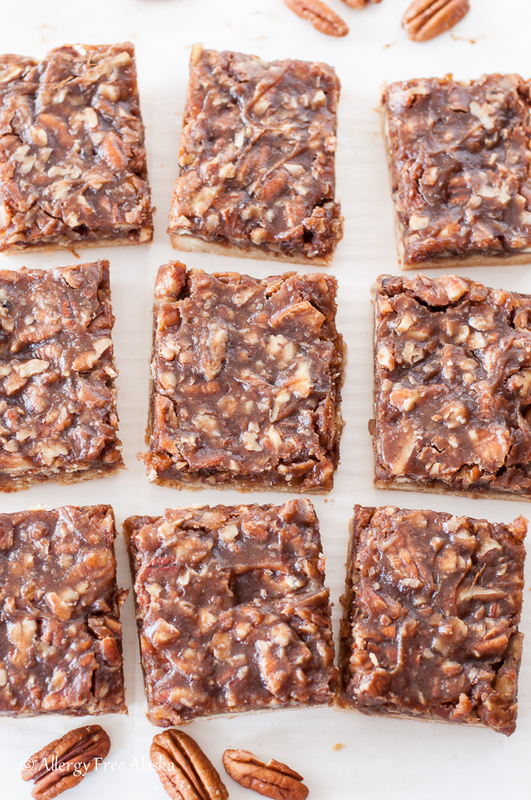 These Vegan Paleo Pecan Pie Bars are super, super decadent. The dates and the maple syrup make the perfect heavenly filling that mimics a traditional pecan pie. If I didn’t know any better, I would never know these bars are completely egg-free, let alone grain-free and refined sugar-free. The delicious pecan pie filling sits on top of a delicious shortbread base. I definitely will use this shortbread base for other bar recipes in the future. It turned out exceptionally well, and everyone loved it. The best part about recipe testing this recipe? Getting to share batch #1 with friends. They all enjoyed them and couldn’t wait for me to post the recipe! Preheat oven to 350 degrees (F). Lightly grease a 9x9” square baking pan (this is my favorite pan to use) and then line with parchment paper. In a large mixing bowl, whisk together the blanched almond flour, sea salt, and baking soda. Add the coconut oil, maple syrup, almond milk, and vanilla extract. Mix well. Bake for 17 minutes. The crust should just be starting to turn golden brown around the edges. Allow the crust to set/cool for at least 10-15 minutes (or longer) before topping with the filling. In a small saucepan over low heat, combine the maple syrup, coconut oil, almond milk, and sea salt. Stir until the coconut oil is just melted and then remove from heat. Drain and discard the hot water from the dates, and place the dates in a blender with the saucepan contents. Blend until smooth, pour back into the saucepan (so you don’t have to dirty another bowl), and then stir in the chopped pecans. Immediately spoon the filling onto the prepared shortbread base and use a spatula or the back of a spoon to spread the filling out evenly. Bake for 16 minutes or until the filling feels like it has set. Cool completely before removing the bars from the pan and enjoying. I love pecan bars! I am adding these to my list to make. 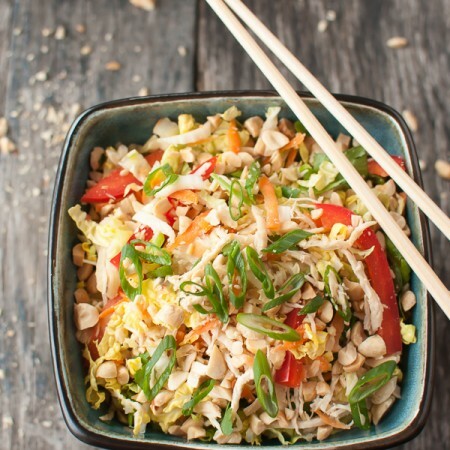 Not sure if I’ll be able to make before Thanksgiving, but thanks for sharing this recipe! Absolutely! Thank you, Carrie! Happy Thanksgiving! Looks wonderful! You had me at dates and pecans because I am crazy for anything with those two ingredients. Any suggestions on pan sizes if the unusual sized 9X9 is not in my stash of cookware? Do I go for an 8X8 and get thicker bars or for a larger pan and have thinner ones? That is a great question, Jean! I think I would be more apt to try an 8×8″ pan. When you prebake the crust, you might need to add another minute or two to the bake time. Try baking for the 17 minutes as suggested. If the outside edges of the crust are golden brown, great. If not, add another minute or two. As for the filling, same thing, it might need another minute or two for the filling to set. Take your finger and gently press on the middle of the filling. If it seems like it’s set, that’s when you’ll know it’s done. These will make a perfect addition to my dessert table on Thanksgiving! They look fantastic! They definitely will! Thanks, Jen! Happy Thanksgiving! I saw these on your Facebook feed and flipped out. I knew I had to try them–pinning and will be making soon. Awe, awesome! Thanks, Kristen! 🙂 Happy Thanksgiving! These look so good, and they wouldn’t last very long here at all! nothing beats shortbread and pecans!! 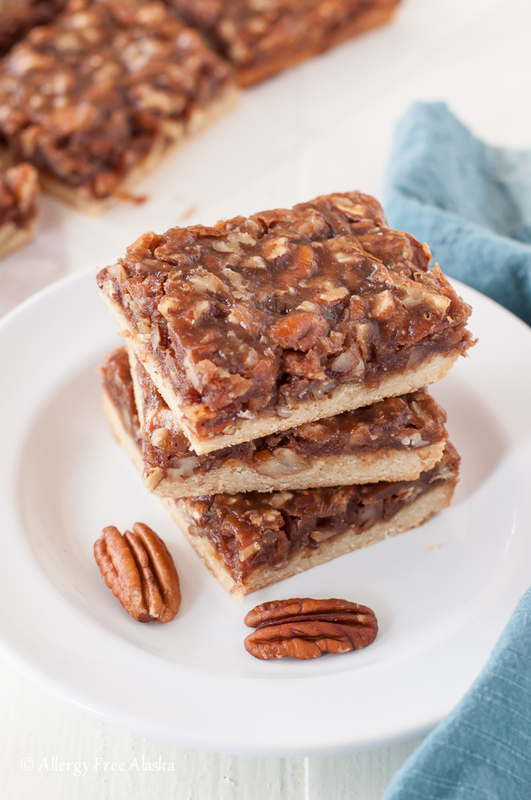 Pecan pie bars are such an easy alternative to a big pie! Yes! 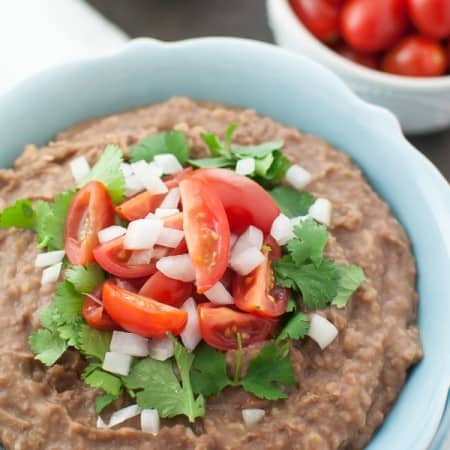 And these are so quick and easy! Thanks Amanda! Bring on the bars! I love any bar! I just made these….they are pure magic!! 🙂 That’s awesome, Angela! I’m so happy you love them! Happy (belated) Thanksgiving! Any suggestions on a replacement for the almond flour in the crust? My husband can’t have almonds, but he can do the pecans. Typically I would use coconut flour but it’s denser. I’m excited to try these over the Christmas season. You could try this gluten-free pie crust recipe, but I’d suggest prebaking it first, before adding the pecan filling. Do you mean 2 cups pecans, chopped,or 2 cups chopped pecans? It makes a difference in measuring, and I have 2 cups whole pecans here. When I chop them, it will be less than 2 cups. Is it enough? I mean 2 cups chopped pecans, so chop, and then measure your 2 cups. Have you tried this with all date sugar rather than maple? Hi Sophia, I have not. Maple syrup provides a liquid, so if you remove a liquid, the recipe won’t turn out right. Oh yum! These were so very good. Loved by my niece who eats grain free and loved by those of us that don’t have food related health issues. Thrilled that you all enjoyed them, Beverly! 🙂 Thanks for letting me know your thoughts! 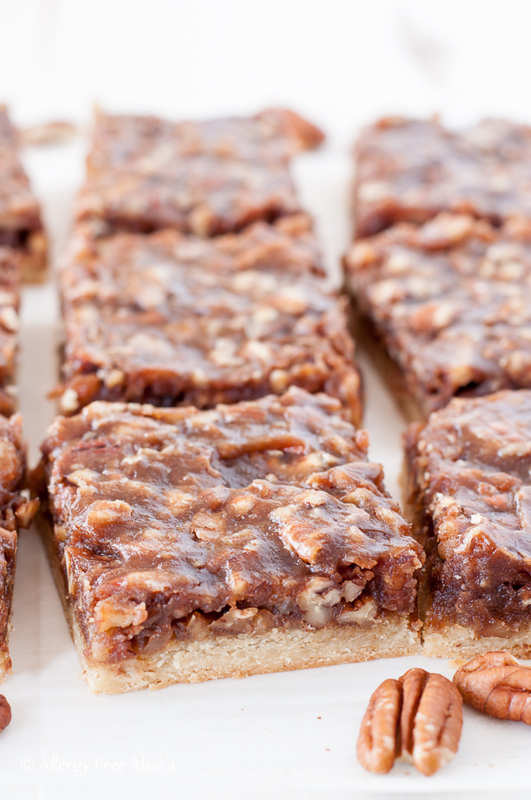 I have tried other pecan pie bar recipes and your is the best!! Bar none (hah punny). Seriously this is the best recipe when it comes to crust, ease of making and taste. Not too sweet and sweet enough. 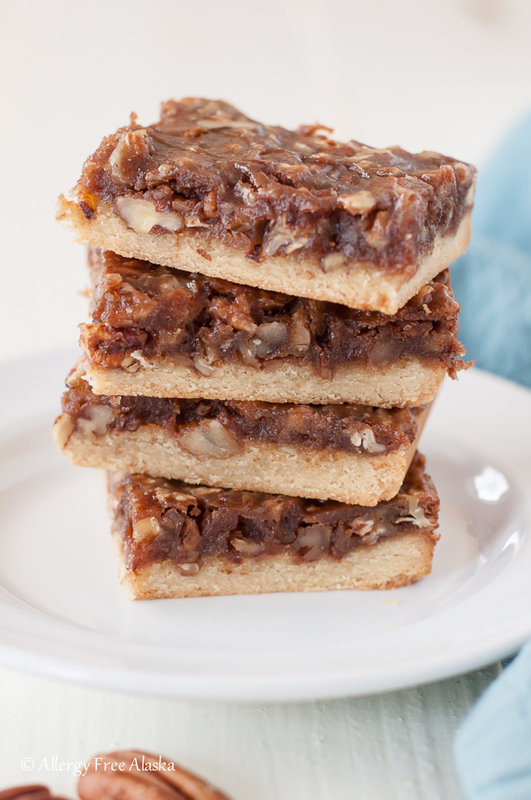 Now my go-to recipe for pecan bars. Blanched almond flour is made from almonds that have the skins removed. They are then ground to a fine flour. MEgan!!! You already ROCKED!!! But now that You are making more paleo recipes available, You are The BEST food blogger site out there!!! Virtual HUGS and prayers coming Your way for You & Yours!! I just made these and they were awesome! While I am not a baker, I keep trying new things and they turn out darn good! Thanks for the recipe. That’s awesome – and you’re so welcome! Thanks for coming back here and leaving me a note that you tried them! 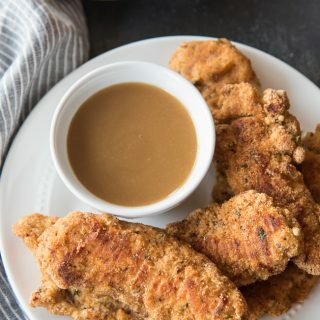 I would love to make these ahead of time, since we are traveling for Thanksgiving. Do you know if it would be better to freeze them fully baked, or make them and freeze before the final step, then thaw and bake the day of serving? Thank you! I think if I were to try to freeze these I’d do it after they were fully baked and cooled. Hi! Looking forward to making these tomorrow! Should i look for medjool dates or can i use dried dates? Thank you so much! Hi Megan (great name! ), I used just regular pitted dates, not medjool. 😉 BUT, medjool would also work if that’s what you have! I’m so happy you enjoy them!